Kim Jonghyun, SHINee’s lead vocalist has passed away. According to the police, Jonghyun was found unconscious in a residential hotel in Seoul on Monday afternoon and rushed to the hospital. He had inhaled carbon monoxide from burning coal briquettes in a pan. His sister had alerted the authorities after Jonghyun sent her a series of suicidal texts saying, “It’s been hard”, “Let me go. Tell me I’ve worked hard. This is my farewell.” His death was made official on Monday evening. He was only 27. Jonghyun’s sudden passing came as a shock to the entire K-pop world. There seemed to be little to no warning signs of his suicidal tendencies, but the heartbreaking truth is, Jonghyun had long shown signs of depression. In the short time since news of his death broke, many revelations have come to light. Shawols and media outlets recalled the times where Jonghyun spoke openly of his personal struggles, be it in interviews embedding it in his song lyrics – he often spoke of sadness and his depression back when he was a radio show DJ on Blue Night. Even his last Instagram post, which was a screen grab of Dear Cloud’s ‘Beside You’, bore poignant lyrics that hinted of his heavy mind. Jonghyun captioned it, “I pray you aren’t hurting”. Posted on 20 November, his upload didn’t seem out of the ordinary in a year filled with constant publicity. Apart from his two solo concerts in early December, Jonghyun was also working hard for his comeback. The singer had even filmed an MV and participated in album jacket filming three days prior to his death. “His new song had a bright vibe. He seemed the same as usual on the MV set. I couldn’t feel at all that he was struggling all this time.” For those who watched the teaser of JTBC’s Night Goblin where Jonghyun makes what’s possibly his last TV appearance, his cheerful façade belies his inner turmoil. The short clip of the upcoming Sunday episode has since been taken off JTBC’s YouTube channel. Especially in Korea, where mental health topics are still regarded as taboo, Jonghyun’s acknowledgement and continuous outspokenness on his depression was not only a brave gesture, but one that had helped many fans through their own dark times. Jonghyun, your voice helped me when i needed it most, when i was going through hard times and when i was going through happy times you were always there for me, you were there for all of us. Thank you so much for giving me joy and hope, for soothing my heart and soul. He was one that helped me get through my depression and convinced me not to kill myself and now he is gone. I am in school crying. Nobody here understand why I'm crying and shaking and I, I just feel broken. not to be corny or saddening but I just received my honors society certificate for academic excellence and I bursted into tears because shinee helped me so much throughout my freshman year, I would’ve struggled so much if I didn’t have them with me. I owe to them and jonghyun. the fact that some people don’t believe that kpop can help your mental health is ridiculous. the music and positive role models that i have found over the past several years have helped me more than you know. jonghyun helped me through some of my toughest times. his words, his music, him. he helped me be happy. i hope he watches over all of us with a soft smile, and i hope that one day i can see his shining face again. Guys. Depression is a serious matter. So please please, don’t ever think “i’ll keep it on the inside cause that’s the safest place to hide”. But, Just say it louder to anyone who you trust. Don’t fight alone. Remember that even the strongest need someone to lean on. Jonghyun was filming Night Goblin happily. He was even preparing for his solo comeback and had finished filming his MV. It only takes a moment for that demon in our head to take control of our mind and decide "This is the perfect moment to die." The release of Jonghyun’s farewell letter, which he had entrusted to Dear Cloud’s Nine9, is a heartbreaking read. And along with its release onto social media came even stronger waves of support advocating for mental health awareness. Perhaps the most painful realisation is that you truly never know who may be suffering. As one of K-pop’s brightest stars, Jonghyun always kept smiling. As a result of his playful personality, he was given quirky, affectionate nicknames by fans – he lived up to each one. Jonghyun never seemed to stop shining. Offstage, nobody knew the extent of his dark thoughts. According to reports by Dispatch, Jonghyun often struggled when it came to music – his personal expectations troubled him greatly and he spoke about “getting bumped down as he gets older”. With the cutthroat culture of the entertainment industry, it is often forgotten that K-pop idols aren’t hit-churning machines. Just like their fans, they are human too. R.I.P. Jonghyun of SHINee i go to Korea often and depression is a topic not often discussed, therapy is almost taboo cause of the country’s “just get over it” attitude. Hope this a wake-up call to the whole industry over there. You will never stop shining. Rest in peace, Jonghyun. Get Ready For '00s Mania With Fall Out Boy's Return To Singapore! 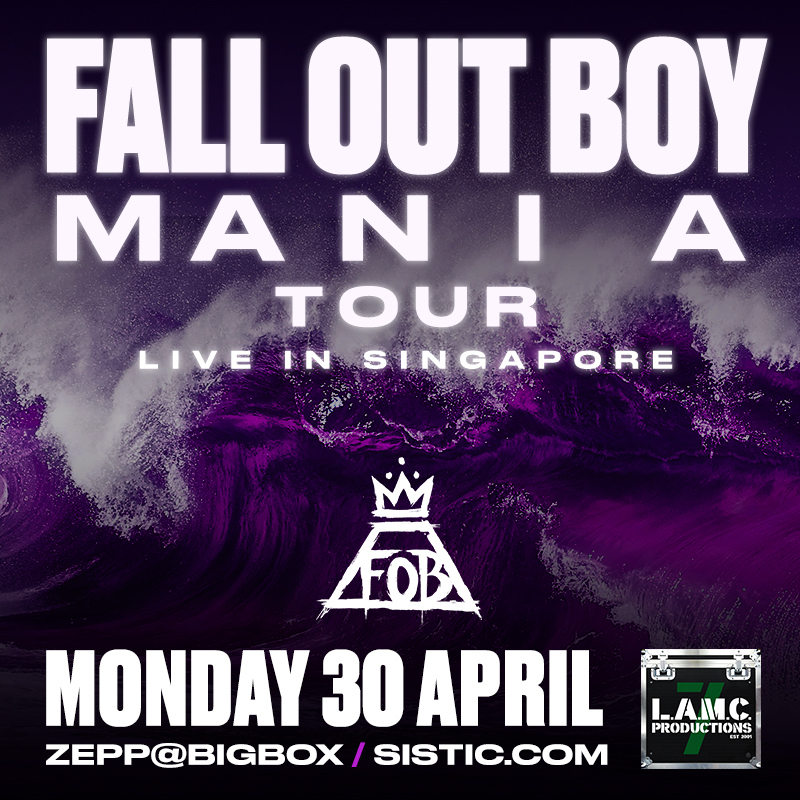 Hailing all Fall Out Boy fans – the rock band returns to Singapore on 30 April 2018 as part of their M A N I A tour! Who’s up for it? Multi-platinum, Grammy-nominated, and one of rock music’s biggest-selling bands, Fall Out Boy is coming back to Singapore for their world tour after releasing their new single “Champion” and “The Last Of The Real Ones” off of their forthcoming album, M A N I A, due on Jan. 19. Known for their many epic hits like ‘Centuries’, ‘Uma Tharman’, ‘Sugar, We’re Goin’ Down’, This Ain’t A Scene, It’s An Arms Race’ and of course, ‘Thnks fr th Mmrs’ (the list is endless), the band remains a staple in playlists around the globe. Brought to you by LAMC Productions, fans are in for a special treat as the band will perform songs from their highly anticipated latest album, Mania, including their lead single, ‘Young And Menace’ and all highly-anticipated hits from their impressive career. In the meantime, listen to Fall Out Boy’s ‘Champion’ remix with BTS’s RM below! Will you be going for M A N I A? Let us know in the comments! Could Joshua Tan Be Singapore's Next Big Action Star? From ah boy to heroic warrior, Joshua Tan is well on his way to becoming a bonafide action star by taking on the most physically demanding role of his career. It’s no secret that Joshua Tan, who rose to fame as spoilt recruit Ken Chow in the Ah Boys To Men (ABTM) series, is always game for action. In fact, the actor has a solid martial arts background in Muay Thai and hits the gym regularly – he even showed up to our interview clad in an Evolve MMA T-shirt! And save for his return to the latest instalment of the ABTM film franchise where he put on a whopping 20kg for the role, we’re betting Joshua has never been out of shape in his life. “It has always been a goal [of mine] to be in a full-fledged martial arts film,” reveals Joshua, who cites Jackie Chan as an influential figure. 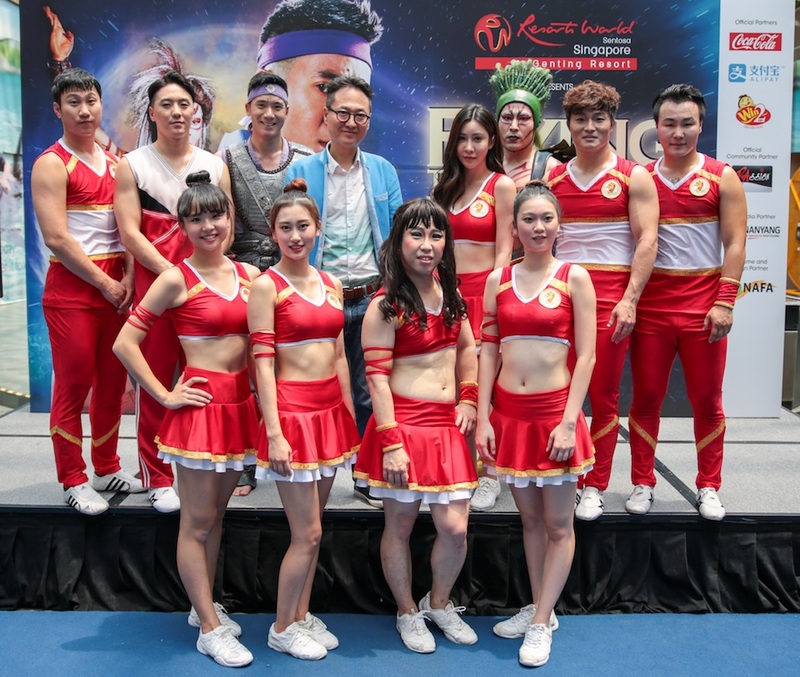 Which was why he didn’t hesitate when approached for Flying Through Time, a live-action production that required extensive training as soon as filming for ABTM wrapped up. While it wasn’t quite the martial arts flick Joshua dreamt of, its sheer physical intensity is right up his alley. Thankfully, most of the training passed without a hitch, and Joshua has since managed to pick up loose Korean phrases, like “ppalli ppalli” (which means faster) or “cheoncheonhi” (slowly), amongst other everyday terms. He has even bonded with the Korean crew, bringing them to eat local delicacies such as roti prata. Flying Through Time runs from now till 21 January 2018. Tickets from $38 on Sistic.